Note that apple green tip should occur app. 101 DD (Base 43.) Based on the SkyBit forecast, which goes out to 4/23, 101 DD's are predicted to accumulate by 19-April (this upcoming Saturday-Sunday). We'll see. 21-April, 2015 (Tuesday) Fruit Twilight Meeting at UMass Cold Spring Orchard, 393 Sabin St., Belchertown, MA. 5:30 PM. 1 pesticide credit will be offered. Light dinner will be served. $20 meeting fee. Contact: Jon Clements, 413-478-7219. Pre-registration is not necessary. 22-April, 2015 (Wednesday) Fruit Twilight Meeting at Carlson Orchards, 115 Oak Hill Rd., Harvard, MA. 5:30 PM. 1 pesticide credit will be offered. Light dinner will be served. $20 meeting fee. Contact: Jon Clements, 413-478-7219. Pre-registration is not necessary. 23-April, 2015 (Thursday) Fruit Twilight Meeting in cooperation with University of Rhode Island at Goodwin Brothers Farms Stand, 458 Greenville Rd., North Smithfield, RI. 2 pesticide credits. Light dinner will be served. $20 meeting fee (except RIFGA members). Contact: Jon Clements, 413-478-7219, or Heather Faubert, 401-874-2967. Pre-registration is not necessary. • This WILL BE YOUT LAST Healthy Fruit (HF) unless you go to the UMass Extension Bookstore (http://umassextensionbookstore.com) and purchase a new 2015 subscription to HF ($50, e-mail delivery only). Alternately, you can send me (Jon Clements, 393 Sabin St., Belchertown, MA 01007) a check for $50 made out to 'University of Massachusetts.' Make sure you note it is for Healthy Fruit subscription, and includes your e-mail address. You can also use this mail-in form to order Healthy Fruit and other UMass fruit publications. • A collaboration of tree fruit specialists in all six New England states, and with Cornell University, the 2015 New England Tree Fruit Management Guide (NETFMG) is a must-have for all commercial orchardists. 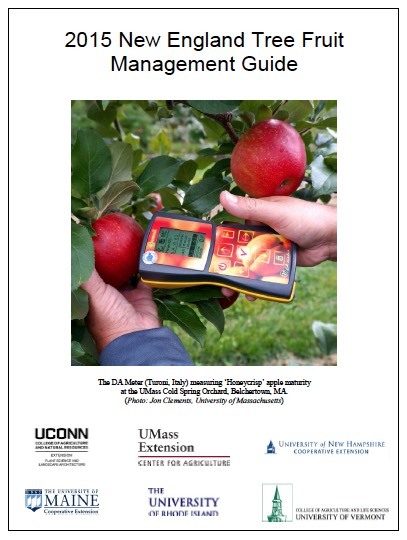 The 2015 NETFMG is 283 pages and includes chapters on: Integrated Crop & Pest Management; Organic Tree Fruit Production in New England; Pesticide and Sprayer Information; Characteristics of Crop Protectants Used on Tree Fruits; Disease, Insect, Weed, Wildlife, and Nutrient Management; and specific spray management recommendations for Apples, Pears, Cherries, Peaches and Nectarines, Apricots, and Plums and Prunes. The 2015 NETFMG is available for purchase for $25 on the UMass Extension Bookstore, http://umassextensionbookstore.com/. (Or you can also use this mail-in form to order Healthy Fruit and other UMass fruit publications.) The 2015 NETFMG will also be available for sale at Fruit Twilight Meetings. Any day now is the time to apply oil to pome and stone fruit to help prevent season-long problems with mites, pear psylla, and scale. Beginning at green tip of apple, a 2% oil application is recommended. Oil can be combined with most coppers. As bud stage progresses, reduce the rate of oil to 1% at tight cluster. Oil should not be applied withing 48 hours (before or after) of freezing temperatures. Captan spray should not coincide with an oil application. Good coverage is essential for effective control, so a 1X spray is ideal, but down to 3X will still work (but is not as good as 1X or 2x). More scale seems to be popping up, so a good oil application is indicated for everyone this year. A green tip copper spray to apple and pear is one part of a fire blight management program. Given the fact there was so much fire blight last year, a green tip copper spray (of your favorite product) at a higher rate his strongly advised. Apply to ALL your apple and pear blocks at green tip.Copper can go on stone fruit to help with bacterial canker and other fungal canker infections. It's recommended to apply 1 lb. (small trees) to 3 lb. (large trees) actual metallic copper per acre to apple trees for fire blight. As an example, Badge X2 is 28% copper, and the label rate for fire blight control in apple is 3.5 to 7 lb. per acre (see below). Therfore, the 3.5 lb. per acre rate would apply just under 1 lb. per acre, while the 7 lb. rate would be just under 2 lb. per acre. 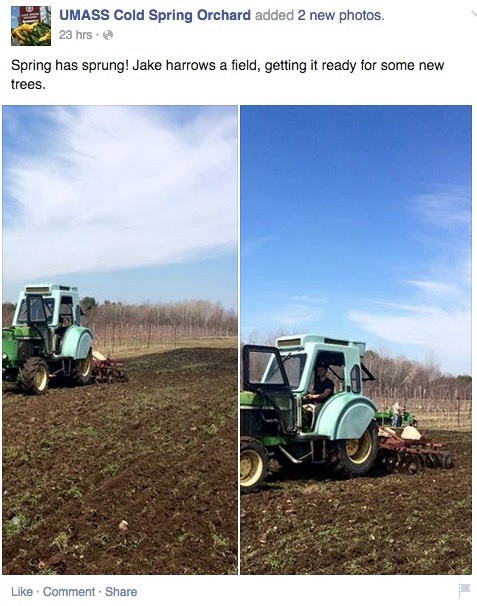 Most MA orchards should be getting 1 to 2 lb. actual copper acre -- I would promote a minimum rate of 3.5 lb. per acre Badge X2 in dwarf or young orchards, but use 7 lb. per acre in semi-dwarf (and larger) orchards. "One of the important parts of fire blight management is spraying copper on trees at green tip. Copper reduces the number of fire blight bacteria on bark and bud surfaces. There are many copper products available, and rates vary. Use the highest label rate recommended for apple at green tip. It is important to keep in mind that copper can russet fruit when applied at a later stage of development. Copper can be applied earlier than green tip, but since its activity is dependent upon residue remaining on trees during the period leading up to bloom, these applications can lead to reduced efficacy. Earlier applications will yield lower copper residue during the critical infection period. Additionally, in an orchard with low scab inoculum, a copper application at green tip will protect against scab for 5 to 7 days." It's not a bad idea to continue to work on orchard floor sanitation to reduce the risk of apple scab infection. Sanitation means reducing the leaf litter, upon which the overwintering scab source occurs, to a minimum. Flail mowing (including as much under the trees as you can!) is very effective, and spraying urea on the orchard floor helps too. See our Fact Sheet Reducing Apple Scab Risks and Saving Scab Sprays. Note that not chopping leaves under the trees means the job is only half done! "Green tip and apple scab season are rapidly approaching. 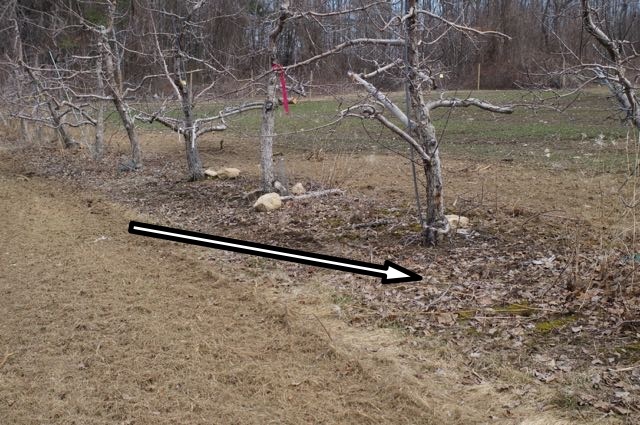 It is not too late, however, to reduce the amount of initial inoculum in your orchard! One of the most important things you can do right now to reduce your scab pressure is to go into the orchard with your mower and chop the leaves remaining on the orchard floor. The leaves will need to be moved into the middle of the rows or the mower must be offset to reach them. This will aid in the decay of the leaves and will flip many over causing developed scab lesions to lay face down releasing their spore uselessly onto the orchard floor rather than on tender green tissue. Additionally, nitrogen, in the form of food grade urea may be applied to the leaves on the orchard floor at a rate of 40lb/A, mixed with 100 gallons of water/A. The urea will also speed the breakdown of leaves and may even suppress ascospore formation. 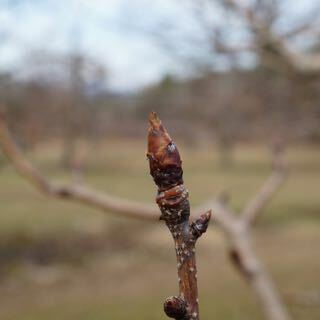 Your orchard will be best served by accomplishing these tasks as soon as possible, before green tip, but will still provide for the reduction of initial inoculum even after this critical stage of bud development." See last week's HF if you have questions about the procedures we are using. On 4/9 we pulled the microscope slide from the outdoor 2-fan spore trap to document any ascospores that might have been released by the mid-week rains last week. RESULT: No spores were seen on the slide. On 4/13 we brought in a fresh batch of 6 scabby leaves from the outdoor collection of scabby leaves (Belchertown). We wetted the leaves and placed them in the indoor funnel spores trap for 20 min. RESULT: No spores were seen. On 4/13 we also performed squash mounts on 10 overwintered fruiting structures (pseudothecia) plucked from 6 leaves to evaluate maturation of ascal sacs containing spores. RESULT: all 10 pseudothecia had some ascal sacs (approx. 50 %) that contained matures ascospores. The "squashing" of the preparation caused some of these sacs to rupture, releasing spores into the drop of water. It is doubtful these spores would have released on their own. 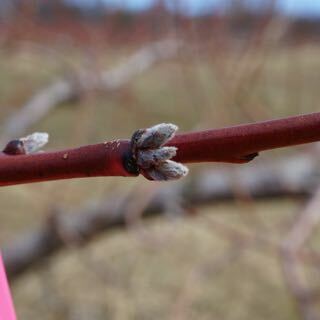 The 'Mac' trees in Belchertown were at silver tip today, and with this warm weather, green tip will be here soon. We doubt we will see spores released in the spore trap tests before green tip, but we will keep you posted. At the same time, we ran a petri plate assay with cut sections of 6 scabby leaves from the same outdoor collection for 2 hours and then examined the 2 slides. RESULTS: No ascospores were seen. Will will attempt to do the 2 lab tests each week, early in the week, until primary scab season is over. The spore-trapping test will be run at intervals that will depend on the rainfall in Belchertown where the scabby leaf collection resides under squares of hardware cloth near the weather station. Editor's note: I am going to bring you some pesticide label registration updates and new products from 2 sources -- Scaffolds Fruit Journal and Michigan State University Extension. I have edited both sources for brevity and local use. Check your state registration before using any product. Thionex - All endosulfan products are currently registered for use in apples only, with an EPA-mandated stop-use date of July 31, 2015. Madex - As a reminder, last May, Madex HP (EPA Reg. No. 69553-1) from Certis USA, was registered for use in controlling codling moth and oriental fruit moth in NYS pome and stone fruit crops. The active ingredient, Cydia pomonella granulosis virus isolate V22, has activity against both of these tortricid pest species, is OMRI approved for use in organic production, and is harmless to natural enemies and other non-target organisms. Application should target the 5% egg hatch point of each generation of OFM and CM, and can be applied on a 7-day interval. It has a 4-hr REI and no PHI. Isomate CM/OFM Mist (Pacific Biocontrol Corp., EPA Reg. No. 53575-44), a battery powered aerosol emitter for delivering codling moth and oriental fruit moth pheromones, received a registration this past winter for use in pome and stone fruit orchards. The supply canister is designed to last all season long (160 days); the unit has an internal clock and temperature sensor, which controls pheromone release. This product is for single season use and is to be disposed of at the end of the season; the unit is compatible for recycling. Kasumin 2L, a new antibiotic, has been registered for use on fire blight in NY by Arysta LifeScience (EPA Reg. No. 66330-404). The active ingredient is kasugamycin, an antibiotic with a different mode of action than streptomycin and oxytetracycline, that doesn't have veterinary or human medicinal uses. Kasugamycin does not have systemic activity like streptomycin, but has been equally effective against blossom blight in field trials throughout the US. It should be noted that orchards treated with Kasumin 2L may not be used for livestock grazing. Refer to the label for further use restrictions. Vivando (metrafenone) is a new fungicide that affects several steps in the infection process of powdery mildew in grapes and has a supplemental label for pome fruit. It has a new mode of action, Group U8, different from other mildew fungicides. It has no curative effect and must be applied before signs of infection. It has a 12-hour REI, applied at 15.4 oz/acre with 3 applications per year (total season use of 46.2 fl oz/acre), with a 7-day PHI. Do not mix Vivando with horticultural oils. Silicone adjuvants are best. Do not make more than 2 sequential applications. There is also a supplemental label for 2 sprays per season in cherry, apricots, peaches, and hops. Certis bought all copper products formerly owned by DuPont, including Kocide 2000, 3000, and Mancocide. Make sure you change the EPA number for the product you are using for your records. They will continue to support Cueva, a lowrate (0.16 lb metallic copper/gallon) copper using a 2 qt/acre rate; it has a 4-day REI in pome and stone fruit. PHI Is 0 days. Double Nickel LC and WDG 55 was registered for use in NYS in 2012 but more growers had opportunity to use it with heavy pressure in 2014. It is a biological OMRI-approved formulation of Bacillus amyloliquefaciens strain D747*. It has a 4-hour REI. It is labeled for use on many bacterial diseases in pome and stone fruit, cane and bushberries and strawberries. For fire blight control, it must be integrated or alternated with an antibiotic program for blossom blight, and mixed or rotated with low-rate copper for shoot blight control. For bacterial diseases on stone fruits, mix or rotate it with copper products. The common commercial use rate for Double Nickel is 1 qt per acre for the LC, and 0.5 lb per acre for the WDG. PHI is 0 days. Vydate – Because of an accident at their manufacturing facility, DuPont will have Vydate only in short supply in 2015. Asana is now a Valent matieral with a new EPA registration number: 59639-209. A Syllit label change on new material prohibits use after pink bud on apples, with no more than 2 applications per season using 1.5 pt/acre mixed with captan or mancozeb. The old label still in the system is still legal until the supply is depleted. It should not be mixed with copper, chlorpyrifos or foliar nutrients. Sivanto (flupyradifurone) belongs to the butenolide class of insecticides, which are agonists of insect nicotinic acetylcholine receptors (nAChR). Sivanto is registered in pome fruits, grapes and blueberries for control of several sap-feeding insects, including aphids, leafhoppers, psylla, scale insects and blueberry maggots. It is also registered in grapes for control of leafhoppers and mealybugs. Sivanto displays translaminar movement when applied to foliage and is xylem mobile. It has shown to be relatively safe on many beneficials, including honey bees. The maximum yearly amount of Sivanto 200SL that can be applied is 28 fluid ounces in pome fruits, grapes or blueberries per season. Apta (tolfenpyrad) belongs to the Mitochondrial Complex I Electron Transport Inhibitors (METI 1), which work by inhibiting cellular respiration in the mitochondria. Apta is registered in stone fruits for control of a range of pests including leafrollers, leafhoppers, plum curculio, Rhagoletis and Drosophila fruit flies (suppression of spotted wing Drosophila). The maximum yearly amount of Apta 15 SC that can be applied is 54 fluid ounces per acre in stone fruits. Nealta (cyflumetofen) is a beta-ketonitrile class miticide with a METI 2 (Group 25 acaracide) mode of action, labeled for use on pome fruits and grapes. Nealta provides knock-down and residual control of tetranychid mites such as European red mites and two-spotted spider mites. Nealta will control all life stages of these mites, including eggs, nymphs and adults. Because Nealta is not systemic, thorough coverage of plant surface is necessary for effective control. Nealta is relatively safe to beneficial arthropods. The maximum yearly amount of Nealta 200SC that can be applied is 27.4 fluid ounces (two applications). Grandevo (Chromobacterium subtsugae) is a mixture of metabolites produced by the bacterium during fermentation and the formulated product contains no viable cells. Grandevo is labelled for pome and stone fruits, blueberries, caneberries, strawberries and grapes, and is listed by the Organic Materials Review Institute (OMRI) for use in organic production. Grandevo is labelled for control of a range of leafrollers, aphids, fruitworms, codling moth, and has shown activity on spotted wing Drosophila in field trials. The proposed modes of action include repellency, reduced oviposition, reproduction of certain sucking insects and mites and a stomach poison for chewing insects. The use of a non-ionic adjuvant is recommended and the spray solution should be near neutral pH. Water with high mineral content should be avoided. Venerate (Burkholderia rinojensis) is a mixture of metabolites produced by the bacterium during fermentation and the formulated product contains no viable cells. Venerate is labelled for pome and stone fruits, blueberries, caneberries, strawberries and grapes, and is listed by the OMRI for use in organic production. Venerate is labelled for control of a range of leafrollers, fruitworms and plum curculio, and suppression of aphids, mites, thrips and stink bugs. The proposed mode of action is exposure to spray deposits and as a stomach poison. The use of a non-ionic adjuvant is recommended. BeetleGONE (Bacillus thuringiensis subsp. galleriae) are aerobic, spore-forming, rod-shaped bacteria that form crystals of protein called delta-exotoxins that when digested by Scarab beetle adults damage the stomach wall, causing feeding cessation which leads to death. BeetleGONE is labelled for control of Japanese beetles in pome and stone fruits, blueberries, caneberries, strawberries and grapes, and is listed by the OMRI for use in organic production. The next Healthy Fruit will be published on Tuesday, April 21 or thereabouts, 2015. As always feel free to get in touch with any member of the UMass Fruit Team (http://extension.umass.edu/fruitadvisor/team-members) if you have questions or comments.